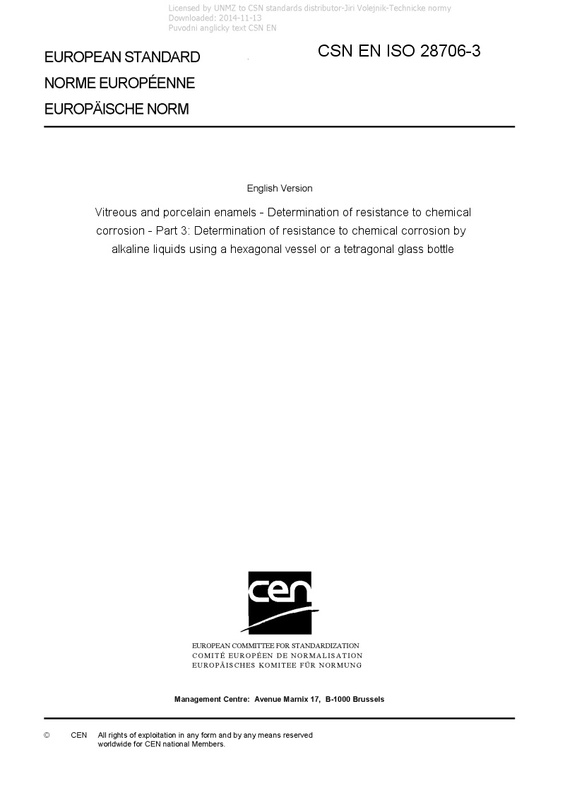 EN ISO 28706-3 Vitreous and porcelain enamels - Determination of resistance to chemical corrosion - Part 3: Determination of resistance to chemical corrosion by alkaline liquids using a hexagonal vessel or a tetragonal glass bottle - ISO 28706-3:2017 describes a test method for the determination of the resistance of vitreous and porcelain enamelled articles to attack by alkaline liquids at temperatures between 25 °C and 95 °C. The apparatus used is a hexagonal vessel in which six enamelled specimens or a tetragonal glass bottle in which four enamelled specimens are simultaneously tested. NOTE 1 The resistance to any alkaline liquid can be determined. However, the test method was originally used for the determination of the resistance to hot detergent solutions, within the neutral and alkaline range, used for washing textiles. NOTE 2 Since detergents are continually subject to alterations in their composition, a standard test solution is specified which, in respect to its alkalinity, wetting properties and complexing behaviour, can be considered as a typical composition for the detergents present on the market. The pH value and alkalinity of the standard test solution depend on the proportions of sodium tripolyphosphate, sodium carbonate and sodium perborate present; sodium tripolyphosphate acts simultaneously as a complexing agent. The wetting properties of the standard test solution are obtained by the addition of alkylsulfonate. A higher sodium perborate content is not considered necessary since the effect of oxygen on enamel is unimportant and an increase in the perborate content does not cause any significant alteration in the alkalinity of the standard test solution. The testing of different enamels using this standard test solution and other test solutions (including 5 % sodium pyrophosphate solution) has justified the use of this standard test solution for determining the resistance of enamels to hot detergent solutions.